He needs your clothes, your boots, and your motorcycle to make his big return in the form of an upcoming video slot machine. 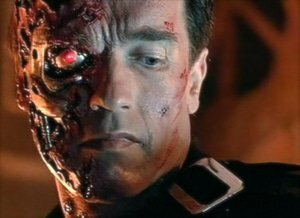 The T-800's second big screen debut has been licensed to Microgaming, a company with an amazing track record for making massive hits out of the material they gain from partnerships, from Studiocanal SA. This makes for a great addition to online slot rosters for those who have played and enjoyed Terminator 2 slot machines in real world casinos and gamblers who happen to be fans of the movie franchise alike. Set to launch in June of 2014, the Terminator 2: Judgment Day slot machine will have adjustable betting to make up to 243 ways to win across the 5 reels. The game comes with a Free Spins feature that increases the number of payable combinations rise to 1024 after lining up three or more Time Travel Orbs, this game's name for its Scatter symbols. Bonus game options use both the T-800 and T-1000 as Wild symbols in play on the reels to crank up the action and increase chances of winning. This summer, get ready for Terminator 2: Judgment Day to explode onto the slots scene with another blockbuster appearance at Go Wild Casino. Be sure to take advantage of the Go Wild free spins bonus to get started, as well as a welcome package worth up to $1000 matching your first 3 deposits just for signing up. Beyond this newest addition, there are more than 350 other games, including over 250 slot machines, to play. Go Wild's mobile casino is also available for gamblers on the go through Android, Blackberry, and iOS powered devices.